Figure 2 of Ali, Mol Vis 2011; 17:1373-1380. Figure 2. Fundus photographs of affected individuals of families PKFP161 and PKRP183. A: OD and OS of affected individual 17 of PKRP161 (age: 28 years). B: OD and OS of affected individual 7 of PKRP183 (age: 55 years). C: OD and OS of unaffected individual 19 of PKRP183 (age: 51 years). 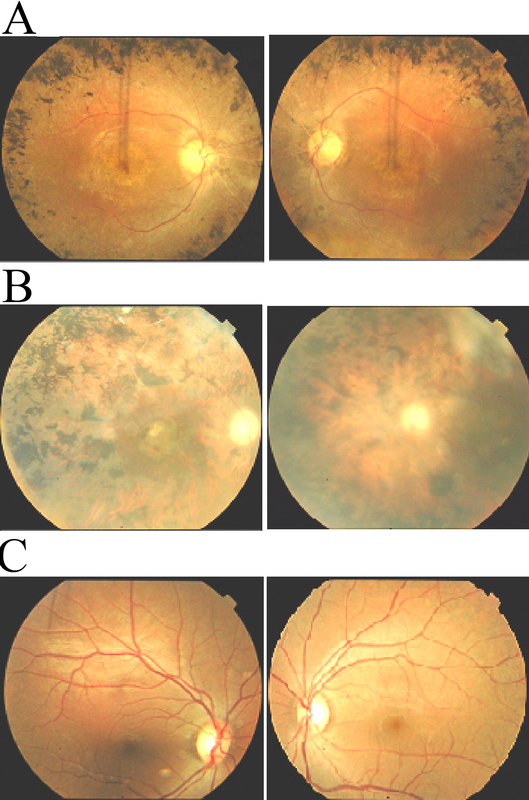 Photographs show peripheral fundus demonstrating several features associated with RP including a waxy pallor of the optic disc, attenuated arterioles and peripheral bone spicules. Visual acuity were recorded as 6/24, 6/24 (OD, OS) and 6/18, 6/18 (OD, OS) for individual 17 of PKRP161 and individual 7 of PKRP183, respectively. OD: Oculus Dexter (right eye); and OS: Oculus Sinister (left eye).